The most popular form of alginate is in powdered form. The paste form has shorter gelation time. 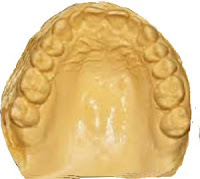 When mixed powdered alginate with water at around 1:1: the mixture becomes a gel, that is set to a rubber-like material. The working time is varied and can be controlled by the manufacturers or the dentist. It is non-toxic and non-irritant material. Alginate is used for taking impression (imprint) of the dental arches for orthodontic model, bleaching trays, mouth guards, and study models.